An oblong brick building resembling a blimp hangar with domes. The interior is richly decorated with colorful icons covering every inch of the walls and ceiling; all of these were newly added since my last visit several years back. Since tonights service was a special choir festival, let me limit my remarks to that topic. On my last visit I marveled at how well the choir sounded. The church has been blessed for more than 50 years with a well-disciplined, enthusiastic, highly-committed choir, named in honor of the 20th century Serbian composer Stevan Hristić. They sing at church services as well as at choir festivals and events throughout the country. For the past eight years the choir have put on an annual festival, and this years concert was the second such event to which choirs from other Orthodox churches were invited. 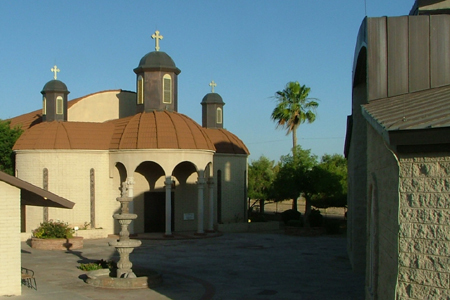 The church sits on a cul-de-sac off 44th Street on Phoenixs east side, just south of the expressway known as "the 202." The area is primarily commercial in nature. On my last visit I noted a vacant lot just across the street from the church and a sign that promised a high-rise residential tower to be built soon. The vacant lot is still there but the sign is gone, and no residential tower has risen up. Lazo Mihajlovich conducted the Stevan Hristić Serbian Choir. Other choirs participating were the St Sava Sunday School Childrens Choir, conducted by Katarina Staniić; the choir of the Romanian Orthodox Church of the Exultation of the Holy Cross, conducted by the Revd Father Alin Munteanu; the Etno Breze Girls Choir, conducted by Gordana Stojanović-Mihajlovich; and cantors Mary, Joshua and Elizabeth Pardhe. It was OK. Actually, in order to gain a better vantage point from which to snap photos, I moved early on to the back of the church and sat on a chair that I had brought in from the vestibule. People sat in small family groups and visited amongst themselves. "Good evening, everyone. Welcome and thank you for attending." This by director Lazo Mihajlovich, who went on to explain a little about the nature and purpose of Orthodox liturgical music. There was a program with translations inserted of some of the pieces. For the final piece, billed as "Introduction to and Canon of the Eucharist", we were directed to turn to pp. 44-46 in "the red Liturgy book", which was Holy Liturgy & Prayers in the Serbian Orthodox Church. There were actually quite a few distractions. An elderly couple arrived late and made a rather noisy entrance during one of the numbers; after taking their seats they looked around for people they knew and waved to any they spotted. Of course, a cell phone went off during another one of the numbers. From my vantage point at the back of the church, I was surprised at the number of people who went out and came back in, again during the numbers, not waiting for a break in the singing. But Ill save the greatest distraction of all for the hellish bits below. It was actually rather informal given its nature. Lazo Mihajlovich spoke a little about each piece before it was sung. He also told us that it was OK to sit during the singing, as this was a concert. (People stood anyway for some of the numbers, and crossed themselves at seemingly appropriate times.) With one exception, though (see below), I really cant say that any of the choirs were remarkable or that any of the pieces they chose were noteworthy examples of the genre. The language of the texts alternated among Serbian, Greek, Romanian and English. As on my previous visit, I cannot praise strongly enough the musicianship (and I emphasize that word, musicianship, for a reason that will become clear in a moment) of the Stevan Hristić Serbian Choir. Their ensemble and tone bordered on the professional. One of their pieces, billed as Opelo (Office of the Dead), written by Mr Mihajlovich and being given its premiere performance this evening, was especially effective. However, the behavior of the Stevan Hristić Choir as they sat in the back pews during performances by other choirs was quite something else. I was amazed at how many of them thought it was perfectly acceptable to whisper, laugh, tease, even play with other peoples hair, while the other choirs, especially the Romanian group, were singing. There were two young girls whose antics were particularly distracting. I shot them one of my most clock-stopping glares, but to no avail. I was even about to get up and say something to them, but just as I was gathering myself to do so, the Romanian choir finished their set and the Serbians all stood up to go back up front. Friends and family were invited to come forward for photo ops with the choirs. I left. 1 – I would probably not be motivated to attend another similar event. On my previous visit to this church I did not find the congregation to be particularly welcoming or friendly, and that was also my opinion of this concert audience. No. I am not attracted to Orthodoxy too much takes place behind closed doors and drawn curtains, and the prayers tend to be awfully wordy, I find. The music can be interesting, but as noted above I did not find tonights presentation particularly so. The boorish behavior of the Stevan Hristić Serbian Choir while their guest choirs were singing.